North Face's Venture Jacket, built using a proprietary waterproof/breathable laminate called Hy-Vent, seems to occupy a gray zone in the TNF lineup. The North Face isn't quite willing to call it an expedition-worthy, full-service technical shell—that honor is reserved for TNF's Gore-Tex gear. On the other hand, the outrageously affordable Hy-Vent Venture Jacket (and matching Venture Pants) is clearly a cut above your basic nylon rain gear. Two things convinced me to give the Venture Jacket a try: I was intrigued by the Venture's ultra-low weight (12.7 ounces on my scale). That's a good 10-20 percent lighter than any Gore-Tex PacLite shell you're likely to find. 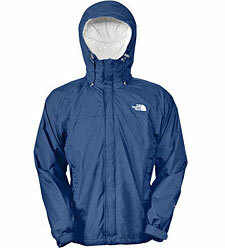 Second, the North Face Venture Jacket's price is low enough to make you think it's a misprint. Since I wasn't in the mood to spend $300 on a PacLite shell, I put in an order. After a full season of use, including regular in-bounds skiing, the Venture has proven its worth. It's still completely waterproof, the construction remains bomber, the fabric has resisted my best efforts to put holes in it, and the taped seams still look like new. As for storm-worthiness, I've worn the Venture Jacket in absolutely abominable conditions, including a tentless bivy through merciless winds on Shasta, and frigid blizzard conditions in the Colorado San Juans, with no complaints. I don't think the HyVent fabric is quite as windproof as GoreTex XCR (a three-ply laminate), but it seems at least equivalent to PacLite. A word about HyVent: it is a genuine laminate, not just a spray-on coating. Like PacLite, HyVent employs a microdot texture to keep the fabric away from your skin, keeping you dry. As far as breathability goes, I haven't found any objective tests I trust to compare it to GoreTex. Let's just assume GoreTex is better, at least somewhat. Just remember—if you're like most people, you'll get soaked in any so-called "breathable" shell if you keep it zipped when you're sweating heavily. So, whether or not the Venture Jacket actually is a technical shell, it sure looks and acts like one. It has all the features you'd expect, including wrist cinch straps, vent zips, a rollable hood, and the always fashionable TNF logo. Plus it costs under a hundred bucks. There must be some reason why GoreTex shells cost two hundred dollars more, but if it's related to performance, I haven't found it yet.